Ten Burger Tricks and Tips – Lid Up or Down? Burgers are a summertime staple in the USA. Everybody can handle ’em. 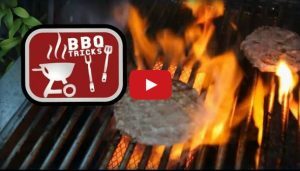 Still – your cook out might just go a bit smoother when you are ready to take on the grill with these quick tips and tricks for America’s favorite BBQ food. good ground beef. Use some egg and bread crumbs too. Not only will it add flavor and moisture but it will help the beef hold together. 2–Chill Out. Pop the patty in the freezer or fridge for fifteen minutes before hitting the grill The chill will also help em hold together. 3– The Dent. You can help keep the patty from balling up by starting with a little dent in the center of the burger. When the meat cooks the dent will diminish and you’ll have a flatter patty. 5- Keep It Clean. Start with a clean grill – fire it up, brush it clean… oil with towel. The grill bits left over from Labor Day’s cookout are not flavor this time around! 6–Check Yer Lid. Lid up? Or down?… the rule is if the meat is thicker than your palm close the lid. If thinner… keep your eye on it. 7 – Keep it simple. Don’t over season. But DO add a secret ingredient to a few patties for fun and conversation. 8–Get Cheesy. Add the cheese at the very end… I use Kraft American singles. 9–Is It Done Yet? Go medium well. It’s best to use a thermometer. Should read about 140 in the middle of the thickest part of the meat. 10–Let It Rest — When you’re done… let it rest. Cutting or biting in too soon will allow the savory juices to drain out onto the plate. Plus the cheese is HOT! Let it rest 15 minutes it’s tough but it’s worth the wait.